Representative Honours: Northern Ireland: 4 Full Caps (1960-1962), 2 ‘B’ Caps (1959-1960), 2 Youth Caps. Club Honours: (with Halifax) Football League Division Four Runners-Up 1968/69 (promoted). 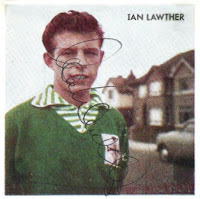 Ian Lawther was on the books of Manchester United as a fifteen year-old but homesick, he returned to Belfast within a couple of months. Although United retained his registration for a period he could not be persuaded to return to Old Trafford and after featuring with East Belfast he instead joined Crusaders. 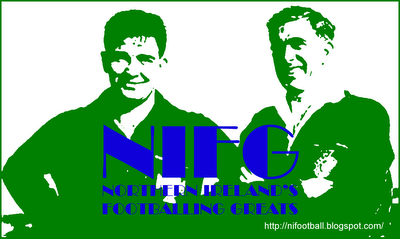 At eighteen Lawther had another go at English football, joining a fast-declining Sunderland. He broke into the first-team at the start of the 1959/60 season, making his Second Division debut at Aston Villa on 31 August. In a remarkable first season in League football he scored seventeen times and he added another 24 in his second campaign. Lawther was also the scorer of Sunderland's first ever League Cup goal, in a 4-3 defeat at Brentford in October 1960. Form such as this could not be ignored by the Irish selectors and after two 'B' caps, Lawther was awarded his international debut against Wales in April 1960. He failed to transfer his club-form to the international stage as he never scored or finished on the winning side in a Northern Ireland jersey during an international career that yielded just four caps. In July 1961 there was a mass-movement of centre-forwards in the English game. Blackburn Rovers sold Derek Dougan to Aston Villa for £20,000 with Blackburn bringing in the £18,000 Lawther as replacement. Sunderland then filled their number nine shirt with a £45,000 move for a certain Brian Clough. Lawther's goalscoring exploits transferred only fitfully to the top-flight, though he was used by Blackburn more often as an inside-forward than his previously favoured centre-forward role. Two seasons at Ewood Park brought a respectable 21 league goals, among them a goal in a 3-0 win at Old Trafford in October 1962. Much more remarkable was his run of goals in the League Cup, five in each season as Rovers reached the semi-finals in 1962 (losing out 4-3 on aggregate to Fourth Division Rochdale) and the quarter-finals in 1963 (where Lawther's ex-club Sunderland won 3-2 at Roker Park). In the summer of 1963 Blackburn decided to look elsewhere for their goals and Lawther was allowed to join Second Division Scunthorpe United in a £12,000 deal. He got off to a flyer for the Iron, netting three times in his first five games, but he finished the season with just nine goals as Scunthorpe were relegated. Lawther hit form in the Third Division, scoring thirteen times before a mid-season move to Brentford. Lawther's transfer to Brentford throws up something of an oddity. He actually signed for the club at the House of Commons where the Bees' chairman, Jack Dunnett, was a sitting MP and supplied a gold pen for the occasion - possibly a unique occurrence in football! Lawther's good form continued at Griffin Park as he took his 1964/65 season tally to 24. Thereafter Brentford and Lawther began to struggle and the team were relegated to Division Four in 1966. A high point of Lawther's career arrived during his first season at Halifax Town. The 1968/69 campaign brought the Shaymen what would be their only ever promotion within the Football League as they finished as Fourth Division runners-up under the guidance of Alan Ball (Senior), father of the England World Cup winner. Lawther contributed fourteen of their 53 goals. Lawther wound down his League career with Stockport County where he played mainly as a midfielder. He came to the public's attention once more when he was sent-off for retaliating against Terry Neill, who had brought him down during an FA Cup tie between Stockport and Hull City in January 1973. It was only the testimony at an FA disciplinary hearing by John Bingham, a Methodist minister and former referee, that saved Lawther from further punishment. During his five seasons at Edgeley Park the Hatters were forced to apply for re-election to the Football League on three occasions, though they were successful every time. With his playing days over Lawther ran a tailor's shop in Halifax and later settled in Swindon. He passed away in April 2010 at the age of 70. Goalscoring ran in Lawther's family. His uncle was Fred Roberts, also an Irish international, who famously netted a British and Irish record 96 goals for Glentoran during the 1930/31 season. Summary: 4/0. Won 0, Drew 0, Lost 4. Summary: 2/0. Won 0, Drew 1, Lost 1. I remember as a young boy watching Ian Lawther play for Brentford in the sixties. Powerful and strong he never took a backward step and I seem to recall many a goalkeeper he bundled over the line (in the good old days when one could challenge a goalkeeper). Best goal was against Hull City where from a corner the goalkeeper jumped up caught the ball and Lawther who had already launched himself, headed the ball from his hands into the net. Great goal! He's remembered fondly by the old Bees supporters. What about Pat Terry? he came to Brentford after Lawther. I'm not sure if he was from Northern Ireland or Eire. His family were boxers and that's exactly how he played. Type of player where the kickoff whistle was like the opening bell. More great memories. Thanks Howard, great memories there! On Pat Terry, I've checked and he was actually a Londoner. By the sounds of him he may well have had a bit of Irish in him though! Ian Lawther joined Bangor City (then in the Northern Premier League) in 1976. His time at Bangor was spent mainly at centrehalf and his calm, cultured defending stays in the memory. A genuinely nice bloke, he lined up at Farrar Road alongside (yet to be) Northern Ireland cap John McClelland before Big John found his position at centrehalf after he joined City from Cardiff as a striker.